Simon & Schuster Books for Young Readers, 9781534428171, 192pp. 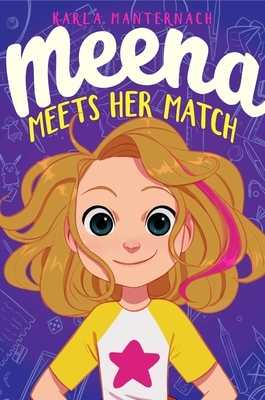 Graduates of the Ramona Quimby series will adore Meena Zee as she navigates the triumphs and challenges of family, friendship, and personal secrets in this charming middle grade debut. That’s when Meena comes up with a plan to create the BEST and most COLORFUL Valentine’s Day Box in the class. With the help of her cousin, Eli, and her stuffed zebra, Raymond, Meena discovers that the best way to break through the blah is to let her true colors shine. At Meena’s age, Karla Manternach was a smudgy kid in tube socks. She once stopped an entire parade by running in front of a fire truck for candy. Karla liked every subject in school but always loved writing best of all. Today, she is a freelance writer who creates books for young readers. Karla lives with her family in small-town Wisconsin. Her favorite color is orange. "[F]or Junie B. graduates...A likable protagonist helms this appealing school story." "Meena’s story will have strong appeal to those who have personal experience with epilepsy and will educate those who know nothing about it." "Manternach draws from her knowledge of her own nine-year-old daughter's chronic condition in telling Meena's story, adding a solid foundation to a story about how to grab all the colors in life."